Sandwell and West Birmingham NHS Trust (SWBH) is celebrating after securing a £75,000 windfall to expand and share its’ volunteering schemes with other NHS organisations across the country. The funding will go towards developing volunteering roles which support patients in staying mobile – maintaining their independence whilst they are cared for at our organisation. The activity support and mobility scheme at SWBH is one of 10 projects singled out by Helpforce, the organisation working with hospitals to enhance the benefits of volunteering across the NHS. SWBH was selected following a competitive process which received 115 applications from 90 trusts. It will be part of the new Volunteering Innovators Programme devised by Helpforce, which will refine and share projects to help other trusts in the UK adopt effective services. Jonathan Maddison, Volunteer Project Manager at SWBH, said: “We are delighted to be chosen and be part of this new programme. “The activity support and mobility volunteer role will be hand in hand with the Trust’s physiotherapists, helping to improve outcomes for our patients. 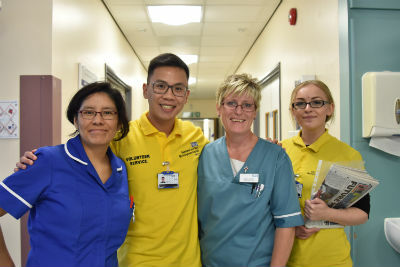 “They will encourage patients who are able, to get out of bed, wash themselves, get dressed into their day clothes, and walk and exercise, so they maintain as much of their normal routine as possible whilst in hospital. This will help to improve their recovery and enable patients to keep the same level of independence as when they arrived in hospital.